It's early in the season yet, but stoic and undersung right-hander Hiroki Kuroda (6-2, 1.99) hasn't just become the Yankees ace, he might just be the best pitcher in baseball. As of this minute anyway, since the Red Sox Clay Buchholz (6-0, 1.78) has dropped from spectacular to merely great. It didn't take long in 2013 for Kuroda to surpass both Andy Pettitte and CC Sabathia as the Yankees dominant stopper. After his first start of the season, when he was lifted as a precaution when a ball hit off his finger, Kuroda has put the Yankees in a position to win his next 8 starts. His only loss was when the Yankees were shut out 2-0, at Coors Field of all places. > In 58.2 Innings, he's given up 42 hits and 14 walks, putting his WHIP at 0.95 (5th in AL). > Of the 42 hits allowed, there have been just 3 HR and 10 2B. So opponents are hitting just .201 and slugging at an anemic .292 (2nd in AL). > And he has allowed Zero Stolen Bases, very rare for an RHP with 9 starts. That must be a concentrated area of improvement since he allowed 17 last season. In the last 35 years, only one Yankee (Roger Clemens, 2001) has won the AL Cy Young award. And in the last 20 years, only one pitcher (Justin Verlander, 2011) has won the AL MVP. With Kuroda anchoring the Yankees unimaginable 26-16 start, he should certainly be in the running for both awards. Though he'll likely have to beat out his own teammate, Mariano Rivera, to get them. 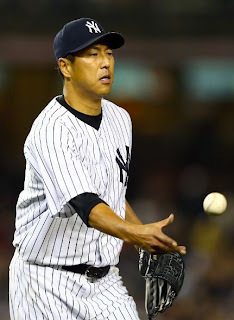 I know it's still early, but I am inspired to make wild predictions everytime I watch Kuroda pitch.